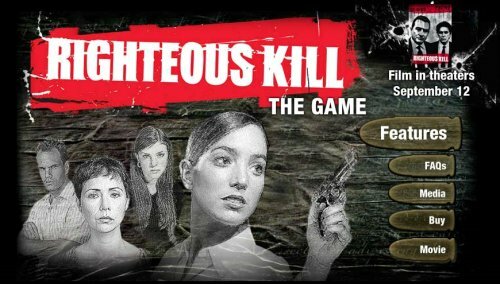 Righteous Kill is a new game inspired by the upcoming feature from Overture Films, Righteous Kill, which has a theatrical release date of September 12, 2008. The movie stars Robert De Niro and Al Pacino as two veteran New York City detectives who are on the trail of a vigilante serial killer. Similarly, the game centers around Officer Erica Dean as she tries to determine who is killing criminals known for committing crimes against women. Players step into the shoes of Officer Dean and, with the help of Sergeant Vasquez, make their way through 16 different crime scenes populated with more than a thousand objects. With each clue they collect and piece together, Players come closer to discovering who is responsible for the string of murders. Animated cut scenes featuring clips from the movie. Voice acting throughout the entire game. A beautiful and realistic visual style conveying the New York City setting. Multiple mini-games bases on detective activities. “This game is perfect for the casual games audience. It is a cutting-edge hidden objects title but also captures the spirit of what we believe will be one of the biggest films of the year,” said Lloyd Melnick, Merscom‘s Chief Customer Officer. Is this game any good? I know it came out a couple years ago, but I still haven’t had the chance to try it. Is it one of those murder mystery games or is it more sci-fi related? I liked the film version of Righteous Kill, but I dont know if I’ll be into the game or not. Any ideas?